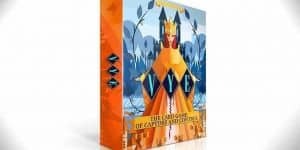 Vye the Card Game of Capture and Control Review | Nerd Much? If the box art alone for Vye doesn’t pique your interest, we’re not sure what would. The artwork is actually what made the card game catch our eye in the first place, and not only does the box art look great, but the contents within are charming as well. The game hails from Sand Hat Games, and it actually began shipping in May of 2015. Somehow, it flew under our radar until a few weeks ago when we came across it when browsing through Amazon’s Launchpad. When you open the box, there’s a bag of colored squares (tokens) that you’ll separate into different piles. Also in the box are five different sets of Family cards that are brilliantly named: House Midnight, House Immortal, House of a Thousand Roses, House of Ladders, and House of the Entangled Soul (see…brilliant!). Each of the different families has four cards that go along with it (called House cards). Set those House cards in front of their corresponding tokens, and remove the Empress card. Each player chooses a House set. Shuffle the rest of the cards, then put the Empress somewhere in the bottom four of the deck. 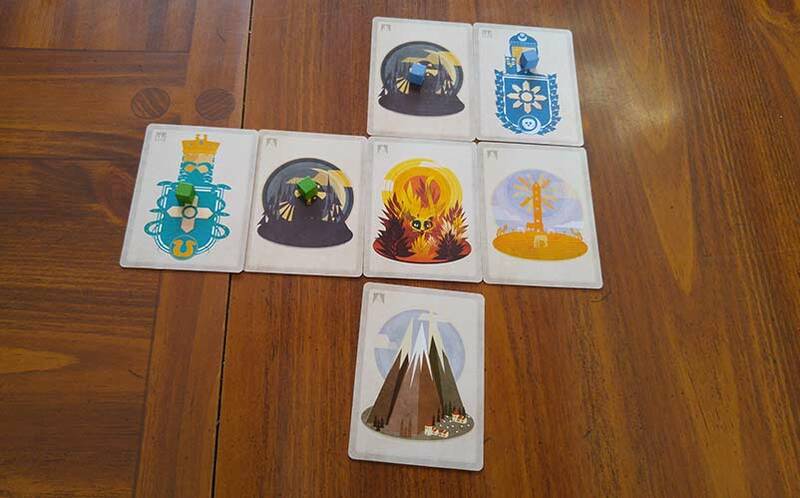 You’ll then setup the initial pattern of cards (there are five cards on the table to start), and then you’ll deal four cards out to all players. Place the remaining deck of cards face down on the table. Boom, Vye is setup. Players are tasked with building the largest connected kingdom by the end of the game (when that evil Empress card is drawn). On every player’s turn, they can choose to play a card from their hand or from their house cards. 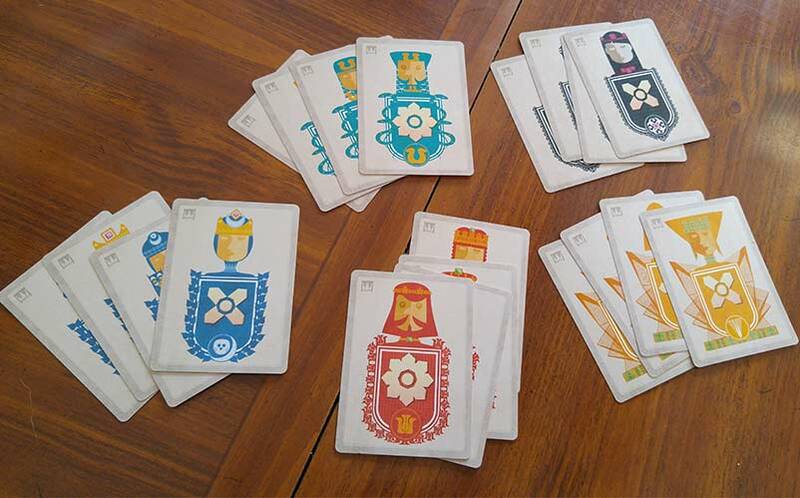 In their hand, they’ll have land cards that when played create a connected kingdom. Cards connect on the sides (not corners), so diagonal cards do not count. The house cards from their hand hold more power, with the ability to takeover another player’s land in a different way. The King will take any land card it touches. The Queen will take any card in an x formation. The most powerful card in your hand is the Advisor, which allows you take every card around you (whether it’s diagonal or not). The Heir card allows you to control it and a single surrounding card in any direction. If a player plays a card from their house, they do not draw a card, but if they play from their land cards in their hand, they will draw one card each turn until the Empress is drawn. The game also contains optional special cards, which in my opinion, is what makes Vye so much fun. They play basically like wild cards, with each Special card having its own rules, and each of the Special cards can be captured by a family. For example, there’s an Ancient Passage card that allows a player to connect two of their kingdoms that are currently unconnected, allowing players to simply place it over an existing card on the table to connect their two separate kingdoms. There’s also an Earthquake card that allows a player to swap any two cards on the game table (excluding the Sanctuary card); you can potential destroy an enemy’s kingdom and gain ground with your own. There’s a Sinkhole card that entirely distrupts a kingdom chain, and is placed on top of a card on the table to basically render that spot unusable. There are numerous types of special cards, and in our experiences, these are what makes Vye so much fun. When the Empress card is drawn, players will tally their largest connected kingdom, and the player with the biggest kingdom is crowned the winner. There’s an almost Tic-Tac-Toe-esque vibe to Vye, in that players can cut off your next potential move, closing off your kingdom and making you start in a new direction, but with a ton of potential complications. Players can also form alliances to tag team against another player (as is the case in most competitive board games), and the idea of trying to acquire the most land gives the game a Settlers of Catan-esque vibe as well. Vye can be ruthless, and depending on the rule set your gaming group chooses to play, it can be a lot of fun filled with “C’mon, man!” and “Wowwww” type outbursts following every move. Because of the different rule sets and other variables, Vye is a game that’s highly repeatable, and it won’t lose its charm after just a couple of playthroughs like some other games might. Vye can take up to 45 minutes per round, depending on how many players you are playing with, but most are ended within a half hour or so. It’s super easy to pick up, and it’s a game that all ages can enjoy. It’s a game with beautiful art, complex rules that are easy to understand, and high replay value. If you’re looking for a brand new board game to play with your game night group, Vye gets our seal of approval, and it’s going to be placed in heavy rotation in our game circle. For more fun new board games to play, stay tuned to Nerd Much?.